Highly maneuverable with a turning radius of 22.4". 19”(w) seat with a head support and a back rest that reclines at the touch of a lever. Slope compensation which senses an incline and increases the power from the batteries, helping to keep a smooth, consistent speed. The batteries must be charged for up to 8-14 hours after each day's use. Chair is heavy, requiring a lift or heist if frequently transporting by car or truck. Comfortable, dependable, maneuverable, sturdy and works very well on inclines. A lot of wheelchair for the price! Unless you’d been using a wheelchair/scooter for some time, it’d be hard for you to understand how much pain and fatigue being tossed around broken sidewalks can cause or why I so appreciate the C.T.M. Homecare HS-2800. 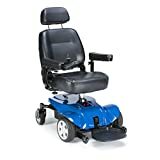 With its highback and headrest, large drive wheels with two front and two back caster wheels this maneuverable wheelchair is built for comfort. 1. The mid-wheel-drive design of the chair allows for a 19” seat with a head support and a back rest that reclines at the touch of a lever. 2. There’s also an extended footplate that can be easily adjusted through three angles to suit your specific needs and the padded arms swing up and are adjustable in width. Along with the wide seat etc. all these features ensure greater comfort than most other chairs offer. 3. 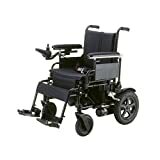 Now at 206 lbs., with batteries that weigh 55 lbs., the C.T.M.Homecare HS-2800 wheelchair is not lightweight. But it can accommodate weights of up to 300 lbs., has a top speed of 4 mph, a suggested travel range of 14+ miles on two 12v 36Ah batteries and an onboard charger that only needs the supplied charging cable. 4. Though heavy this wheelchair is highly maneuverable because its six-wheel, 2-motor mid-wheel drive train and 10” middle (drive) wheels allow for a very tight turning radius of just 22.4”. 5. The joystick can be mounted on either the left or right armrest and is extendable/retractable and the seat also swivels, enabling you to get close to a table, which can be a problem with many other wheelchairs. 6. Built-in self-diagnostics check basic functions, such as battery fault or motor fault, every time you power up and sets off an alarm if it detects a problem. 7. As with all C.T.M. 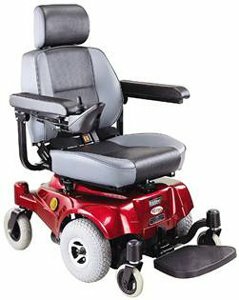 Homecare wheelchairs the HS-2800 comes with slope compensation which senses an incline and increases the power from the batteries, helping to keep a smooth, consistent speed. The C.T.M. Homecare HS-2800 comes with a 3-year warranty on the frame, a 13-month warranty on the electronics/drive train components and a 6-month warranty on the batteries. One major drawback with the C.T.M. Homecare HS-2800, for me anyway, it is recommended that the batteries be charged for up to 8-14 hours after each day’s use. And although the chair can be broken down into two easy-to-assemble/disassemble parts, the base and the seat, it is not something I’d recommend as the base is very heavy indeed (100 lbs. ), even requiring a lift or heist if frequently traveling by car or truck (e.g. https://www.amazon.com/dp/B00EF3PEC2?psc=1). And if you intend straying far from home, especially if traveling over uneven terrain like grass or gravel the ride may get a little bumpy and jarring. If you’re looking for a maneuverable wheelchair that’s comfortable, dependable, sturdy and works very well on inclines you needn’t look much further than the C.T.M. Homecare HS-2800. And it comes at a very competitive price too!